Following up on its first humidifier that used a UV light to kill germs in its water reservoir, Dyson has just announced an updated version of its Cool fan that now includes a built-in 360-degree glass filter to remove 99.95 per cent of airborne invaders in a room. 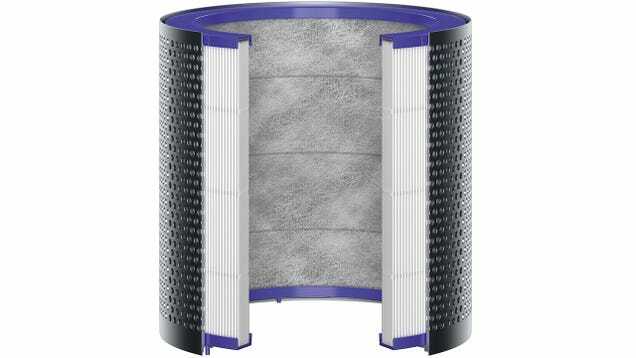 And not just any filter, but a high-efficiency particulate arrestance (HEPA) filter – the best in the business. Since a fan is often pointed directly at people, the inclusion of a HEPA filter on the new Dyson Pure Cool means that any germs or allergens floating around won't be directed right towards them. And the use of a 360-degree filter means that all of the air being sucked into the Pure Cool's base passes through it and is scrubbed of all particles as small as 0.1 microns. To torture-test its new creation Dyson's engineers blasted smoke from 228 cigarettes through the filter without seeing any drop in airflow or performance. And hopefully it works just as well with pipe smoke, because everyone just looks cooler with a pipe in their mouth, right?